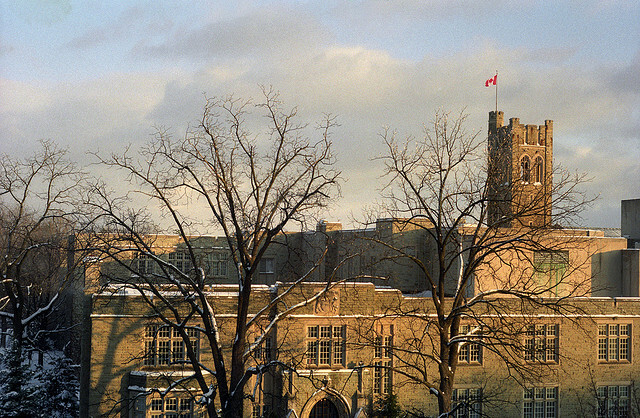 Photo of Western University by Flickr user Lars Plougmann, used under a Creative Commons licence. Western University is starting a Syrian refugee sponsorship fund and making scholarships available for those fleeing the war-torn country. The school announced today the Faculty of Social Science is partnering with the London Cross Cultural Learner Center to set up a fund for a refugee family. The initial goal is to raise $30,000, which is what it takes to sponsor a family of five refugees. To donate to that fund click here. If more than $30,000 is collected additional families will be sponsored. Western is also working to establish 10 Syrian refugee student awards. Tuition and living costs will be covered for up to 10 students, who will be admitted as early as January 2016. Applicants for this award must be Syrian citizens who meet the university’s admission requirements. Finally, Westerns is a member of the Scholars At Risk program, which means the school can host scholars who are facing human rights abuses in their own country. Work is being done to identify Syrian scholars that can be brought to the university.